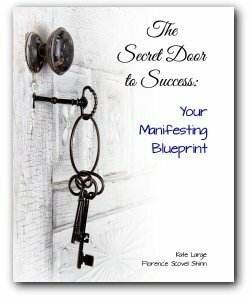 Florence Scovel Shinn's original Secret Door to Success is a compilation of 14 lectures. Kate has taken those lectures and restructured their order to support manifesting what you wish to create. Each section includes Action Steps and your Manifesting Blueprint to guide you step-by-step to create your personal, customized manifesting blueprint for prosperity. If you would like to take Florence's teachings about success to a new even more personalized level, please click into The Secret Door to Success MASTERMIND here. Contact Kate to be put on the list to be notified of the next mastermind!